Regardless of your online advertising budget and strategy it is important to know how and where to spend your marketing dollars. An important step in launching an online advertising campaign is to understand the different advertising networks and how to use them. Today&apos;s post is an overview of two of Google&apos;s networks; their benefits, how they operate, and a few best practices. The user has a strong intent to view the content you&apos;re offering on your website. A user types a keyword/query (what they are looking for) into the search engine and is served relevant results related to that keyword. 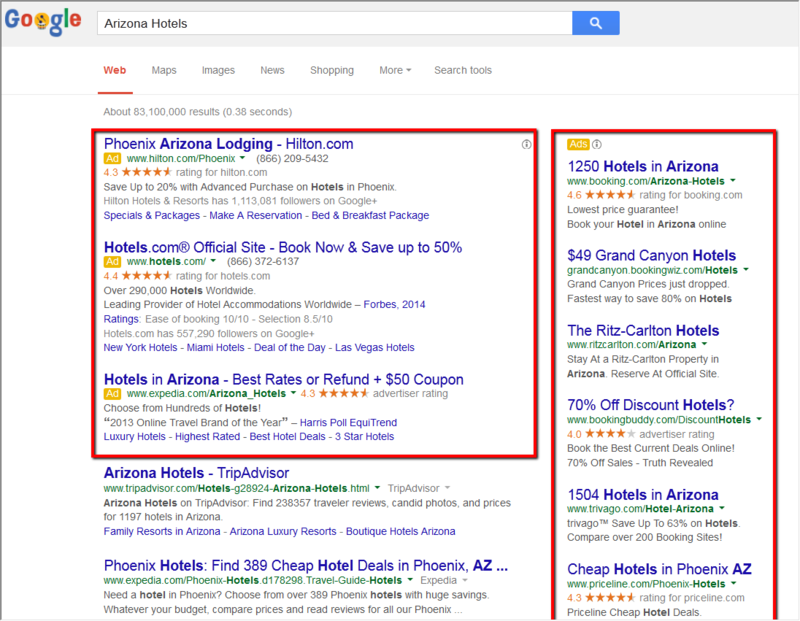 Example: A user visits Google and types in "Arizona Hotels" into the search bar and this is the result. Make sure that your keywords are relevant to the landing page. Your ads should relate to the keywords you are bidding on and to the content on the landing page; also use a strong call to action. You are reaching users who have already shown an interest in your destination. A remarketing tag is placed on the pages of your website. When a user visits they are cookied. This cookie tracks how a user engaged with your site, what pages they visited, which pages they didn&apos;t visit, etc. You can use this information to create audiences and serve them a display ad based on what they were interested in to bring them back to your site. Or maybe to point out something they missed while on your site. Example: You are running an attractions pass campaign. A user visited your site and browsed through your things to do page, and even clicked around through your attractions page, but they didn&apos;t touch your attractions pass campaign page. You can create an audience with those parameters and now serve them relevant ads throughout the display network to come back and check out this great attractions pass in your destination. Ads should use a strong call to action. Use Frequency Capping; do not over serve your ad, 3 times per ad per day or less is a good starting point. The content of the sites your ads will be served on are related to the content you are advertising. Keywords and Topics are grouped together because they are both contextually targeted. Each page within the display network is analyzed and categorized into a central theme or topic. If you run a display ad based on keywords then Google determines how these keywords relate to the topic of a page and will decide whether to display your ad on that site. Also, you can specifically choose the topics for the type of pages you want your ad to be displayed on. Example: Fishing is huge in your destination and you want to run a campaign to drive traffic to your fishing page. You can choose keywords based on the type of fishing in your area, fly fishing, ice fishing, and other keywords that relate to what is available in your destination. Your ad will show up on pages that talk about this type of fishing. Or you can target the topic "Hobbies & Leisure>Outdoors>Fishing", "Travel>Tourist Destinations>Lakes & Rivers", etc. The two can also be used in tandem with each other to narrow your target even further. Your ads will be served to users with interests related to your content. Interest targeting is based on the user. As users browses the internet a profile is built to understand what their interests are. With interest targeting you can use this information to display an ad to someone who has shown interest in a topic that relates to your destination. Example: A user has spent a lot of time looking at websites for night clubs all over the country. Your destination has a booming nightlife. You can target this user&apos;s interest through "Nightlife Enthusiast" and serve them ads raving about the amazing nightlife in your area. Ads should be relevant to the interest of the user and use a strong call to action. Relevant ads will be served to your target audience. Google has three demographic targeting options; gender, age & parental status (this is new). The targeting is pretty straight forward. You can reach users specifically based on their gender, age group, and parental status. Your ad will be displayed to users who fit the parameters you define for targeting. Example: There are two great ways you can use this information. First, if you have spent the time and money to find out who is visiting your destination you can use those parameters and target users who fit your visitor profile. Second, let&apos;s say you want to push family getaway packages in your destination. You can target the age groups 35-44, 45-54 & 55-64 along with the parental status of "parent" to display ads only to them about your great family getaway offers. Ads should have a strong call to action. Best if used in tandem with other targeting such as topics, keywords, or interests. You choose exactly which websites or applications your ads will show on. With placement targeting you can choose specific websites and applications across the Google Display Network on which you want your ad to be displayed. This is a great way to narrow down your target and get really granular with where your ads are displayed. Although more targeted, your ads will typically be shown to a much smaller audience. Example: Your destination is known for its award winning golf courses and this historically is one of the biggest selling points for people to come visit. You can go through Google&apos;s list of placements and choose websites that specifically relate to golf. With these targeted placements you know you&apos;re serving your ads to someone who, in that moment, is showing interest in golf, and may be drawn to check out your destination. Ads should have a strong call to action and be relevant to the websites and applications on which they are being displayed. This has been a quick overview of two of Google&apos;s online advertising networks. If you have any questions about or interests in online advertising please contact us. 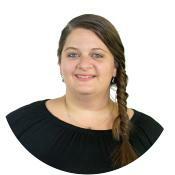 Michele began her adventure at Simpleview after six years in the hospitality industry. As part of Simpleview's digital marketing team she has gained experience and knowledge in SEO, Paid Media, conversion rate optimization (CRO), and more areas of the martech stack. As a CRO Analyst, Michele helps deliver customer success by analyzing and implementing growth driven website strategies for DMOs. She is also responsible for guiding the strategic success of clients' Conversion Rate Optimization and UX consulting engagement, while providing leadership and experience in helping to architect the ideal site experience.